Thank you for your interest in supporting the work of the Egyptian Red Crescent. We are trying to provide help and support to the suffering and needy in Egypt and abroad. One of the best ways you can make a difference in the lives of these people is to make financial donations to support our work. 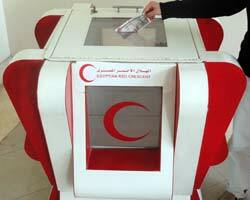 Donations may be made directly to the Egyptian Red Crescent bank account in either Egyptian Pounds or US Dollars.